© 2015 by Kat Howard. Originally published in Guillotine. Reprinted by permission of the author. Elaine broke her curse like a mirror, heedless of the shards that scattered across the floor. The guests at the party laughed, applauded, whooped with delight at her reckless abandon. She offered them an exaggerated curtsy, holding the pose as she held their eyes, reveling in their gaze, in the simple pleasure of being seen. The broken pieces of the curse slid into liquid, shimmering like mercury before fogging into smoke and disappearing. A minor curse, to be gotten rid of so easily. Nothing that had grown thorns and teeth. Nothing that had developed a craving for breath or blood. Color high in her cheeks, Elaine plucked a glass of champagne from a passing server and drank. Her laughter was as bright and sharp as the bubbles, as sparkling as the crowd that surrounded her, all of them here to celebrate her freedom. Her guests traded stories as they drank and danced, reminiscing about their own curses—ah, yes, sleeping does tend to run in families; certainly it is painful for words to turn to diamonds in your mouth, but when it was over I had them made into this tiara—and the breaking of them. They marked their relief at being past such things with every clink of glass upon glass. They would drink until their memories were replaced with a shining haze. Until their own curses were nothing more than half-remembered shadows, until they could look at their tiaras without remembering the taste of blood and saliva as the diamonds fell from their lips. Glass in hand, I left the too-bright room, the aggressive celebration. Happy as I was for my sister, that room wasn’t mine. Curses can be lingering things. My own curse was silence. It’s common enough, particularly for girls. We’re so often encouraged not to speak, and that practiced quiet makes it easy for a curse to steal our voices. Because silence is one of the traditional curses, there are a plethora of known ways to break it: I could weave or sew a certain number of shirts out of some material rough enough to cut my hands and stain the fabric with my blood, all without weeping. I could endure a loveless relationship for a year and a day. I could perform some tremendously useless task: find one incorrectly sorted seed in a barrel of its near-identical cousins and nurse the plant to flowering, my voice to return with its blooming. There are traditions. Established guidelines. The curse falls, you purchase the way of breaking it, you move on. That is what is done. Expected. Traditional. And in that safety, the seeds of the second curse. To have a voice only when it is given, only after asking nicely, following the rules. So I decided to break my curse myself. It wasn’t the done thing, but it wasn’t impossible. I could afford to be eccentric, and people don’t mind a curiosity, so long as she’s quiet about it. “I don’t know why you were worried that something would go wrong.” Elaine stood in front of her mirror and rubbed at her eyes, smudging the memories of the party into her faded eyeliner. I worried just the right amount. You’ll see them sometimes, people with pieces of their curses still clinging to them. Half-transformed into birds—taloned feet and feathers instead of hair—or with snakes slithering through their teeth along with their words. And then it gets worse, until there is nothing left but a sad-eyed bird that doesn’t quite understand wings, a knot of serpents, a pool of silence in the shape of a girl. Curses, if not properly broken, put roots into your blood and bones until you are nothing but a garden of misfortunes. Elaine acted as if she’d never been cursed. That’s tradition, too. When it’s over, there’s no need to look back. But in the days after the party, mirrors began to appear. Logical places at first—windows silvered over and offered reflection rather than transparency. Puddles became glass underfoot. I stopped and stood next to her. Sister dark and sister fair. She was right. The reflected colors of her clothing were wrong, faded somehow. She wore an eye-catching blaze of red, but it looked barely pink, and she was nearly transparent. “So strange,” she said. “I’m almost gone, but you look the same. Maybe it’s just the angle.” Elaine smiled at her reflection and kept walking. I looked at the mirror slantwise, my gaze unfocused, searching for the haze of a curse. Nothing. But as I turned away the glass seemed to alter, to shimmer like liquid, like mercury. I froze then shook my head. Only a window again. Most people only ever notice the manifestation of the curse. You know that your sister has fallen into an unwakeable sleep, that your brother speaks only truth, no matter how brutal, and those things are enough. But each curse has a shape. This is what a curse looks like: a necklace of thorns, bright against a throat, sharp enough to open a vein. To break it, you see that the curse is water, and you drink it deep. Or a curse may look like a vine of ivy, lush and green, roots almost unseen but hooked like claws beneath the skin. You make yourself salt and ashes, inhospitable ground. A curse may bind you, like a gag of shadows. And your words are knives, cutting through. All at once the mirrors, like curses, were broken. They did not return to what they had been before, windows and water and other, more usual things, just sat cracked in their stolen frames. The sensation of the mirror’s teeth reaching for me lingered. I didn’t like it at all. When a curse is broken, nothing of it remains. It’s swept away with the faded party decorations, poured out with the flat champagne. It’s tradition not to talk about it, no matter what the curse was. To never ask someone what it was like to be shifted out of their shape every full moon, to be winged and feathered, to be unseen. To not tell anyone what it felt like to be strangled by your own words. To drown on unspoken poetry filling your lungs. To taste every silenced hello and goodbye like grit on your tongue. All gone. Except for the memory. Most people will not see you if you cannot speak. When I was cursed, I was ignored, shoved aside, treated as if I didn’t exist. Elaine made a point of carrying paper, so I could still talk to her, after a fashion. She asked me questions, as if expecting an answer. She said hello when she saw me. She said I love you. My curse breaking was the sound of locks flinging open. It was shadows falling away and ropes unraveling. I wrote down all of the things I would have said. Every word, every shout, every hesitation. I unsilenced myself, writing each unspoken thing over and over until the pages were covered in my unheard voice. I lit the pages on fire, giving my words air the only way I could. My voice was a rusted hinge, so quiet I thought for a moment that I had done something wrong, that instead of breaking the curse, I had bound myself in it forever. My heart clenched around the thought that I could have been safe, that I should have asked nicely. There were reasons for the traditions, and I was no better than anyone who had followed them. I should have known. Then I realized the weeping, howling animal sounds I heard were my own. “I think something went wrong,” Elaine said. Elaine’s curse had been invisibility. Again, a common one, with well-established traditions. Quests were the usual thing in this circumstance—finding someone to fall in love with her, or to speak to her achievements, rather than her physical beauty. Instead, she captured her reflection in a mirror and then shattered it. I stood before the mirror in the corner of my room. I could see everything in it. Except for my sister, and myself. There are rituals. Traditions. A curse, once broken, breaks easier a second time. Death becomes one hundred years of sleep, becomes one thousand and one nights telling stories. We know what our curses are when we see them, and we know their undoing. But there is a catch. We may know how to break curses, but they know how to bind us in the first place. It wasn’t just our mirrors that were affected, but all of them, everywhere. No matter who gazed into them, no reflection showed. It was as if everyone had turned invisible. “I hate it,” Elaine said. “I look in the mirror and it’s as if I’m a ghost in my own house. And the worst part of it is, everyone looks at me now. They know the mirrors are my fault because they know what my curse looked like, and so they stare. They don’t even pretend not to. I can’t be seen when I want to be, and no one will stop looking. After I learned how to see my own curse, I discovered that I could see other people’s, too. It wasn’t difficult—once you know that something is there, know the way you need to look to make it visible, it’s more effort to ignore it. Seeing the curses, understanding them, had the same sort of pleasure as fitting pieces into a puzzle. I liked the small click. And what I could see, I could break. It didn’t take long after I broke my own curse for word to get out, for people to come to me for ways of undoing when their own curses fell. My methods were of interest at parties, and besides, it was easier to listen to me explain how to slip off shoes of red-hot iron than to walk until they were worn through. I had seen Elaine’s curse, too. Tiny mirrors, strung together like bracelets and a necklace, a matching set, reflecting only her face. I would have unstrung them carefully, one by one, rather than smashing them to pieces—bad luck to break a mirror. But she wanted to break the curse herself, and who was I to judge her for that? I loved my sister, so I did not tell her to be safe, and hoped for good luck. The piece of her curse was missing from my room. I went looking for Elaine to see if she had taken it back, to try to undo that final tiny bit herself. She was looking out her window, a window that was transparent as expected. Across the wall, the edge of her—shoulder and elbow and thick curls of hair— reflected in her mirror. She turned to me, and I saw myself, perfectly reflected in the mirrors of her eyes. This is what is means, to break your own curse. It means knowing what the curse is. Not how it manifests, not why it fell upon you rather than some other, not what people say it means, that such a curse has chosen you. It means seeing it truly, recognizing the truth at its red and bloody heart. And so, it means knowing your own red and bloody heart as well. I repeated her name and closed my eyes. Seeing myself looking back instead of Elaine looking out was an ache. It took an effort to open my eyes to meet the mirrors of hers, to confront myself, reflected back. I stepped closer, looked sideways, walked around my sister while she stood, perfectly calm. No hook, no thorns, no sharp edges or claws. No trace of the curse that the transformation had come from. She looked, I thought, happy. I closed my eyes again so hers wouldn’t reflect my tears. We don’t talk about how the curses happen. We grow up knowing that certain curses run in families, that boys get cursed into monstrosity and girls into sleep, and we leave it at that. It is easier to imagine that our curses simply fall on us like shadows, inevitable at certain times, rather than to acknowledge the unseen truth: Someone, somewhere, sets them in motion. If you know the heart of a curse, you can break it. If you know the heart of a person, you can give them a curse that thinks it’s a blessing. We don’t talk about the memories, and we imagine that silence is the final act in the curse’s disappearance. In our hearts, we know that’s not true. There is always something left. I hugged my sister hard. In my finger, tiny slivers of a mirror, like small biting teeth, pressed against the inside of my skin. 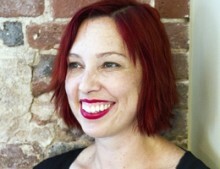 Kat Howard is the author of the novels Roses and Rot and the Alex Award-winning An Unkindness of Magicians. Her short fiction collection, A Cathedral of Myth and Bone, is now out from Saga Press and she’s writing The Books of Magic for Vertigo Comics. Her novella, The End of the Sentence, co-written with Maria Dahvana Headley, was an NPR Best Book of the Year in 2014. She currently lives in New Hampshire, where she is working on her next projects.